The traditional medieval castle is regarded as the ultimate stronghold, protected by deep moats and thick walls. Until recently it was thought that the only effective way for an invader to take such a fortress would be to lay siege to it; to literally starve the enemy out into the open. But now historian Dylan Chokice has cast doubt on this belief by pointing out a flaw common to most of the castles of this era - one which he says was exploited by invading armies on more than one occasion. Having conducted an extensive tour of Europe's surviving castles, Mr Chokice has noted that whilst they all have many impressive and daunting defensive features, in almost every case the main entrance is only protected by a turnstile. 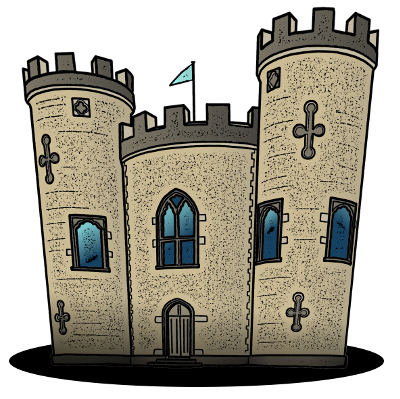 By paying a nominal fee to a man in a ticket booth, invading troops would have been able to gain access to the castle grounds completely unhindered. Sometimes they were even given a map. This has totally changed our view of history. When once we might have imagined vast armies camped outside castle walls for months - sometimes years - at a time, we now have a more accurate picture of small bands of elite tourists entering the castle on a single family saver ticket, enjoying a brief visit to the petting zoo then taking the giftshop by force and holding it until reinforcements arrived.